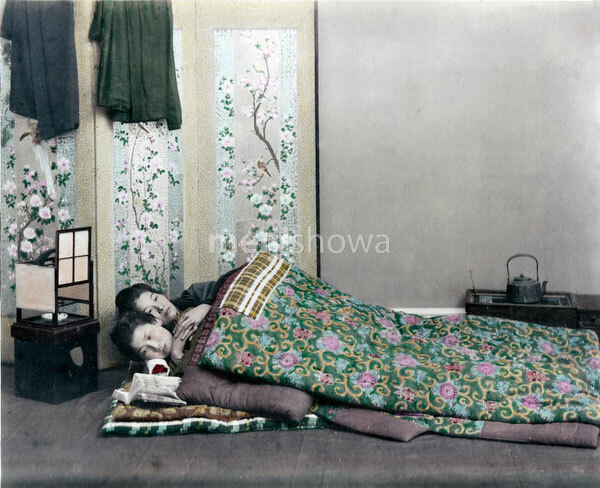 A studio photo of two women sleeping in wadded futon bedding with their heads on wooden head supports. It must be Winter as they use two layers for both mattress and cover. There is an ando lamp near their heads. A folding screen illustrated with flowers and birds stands behind it. Near their feet is a hakohibachi (brazier encased in a wooden box) with a tetsubin (iron hot water kettle). See blog entry.